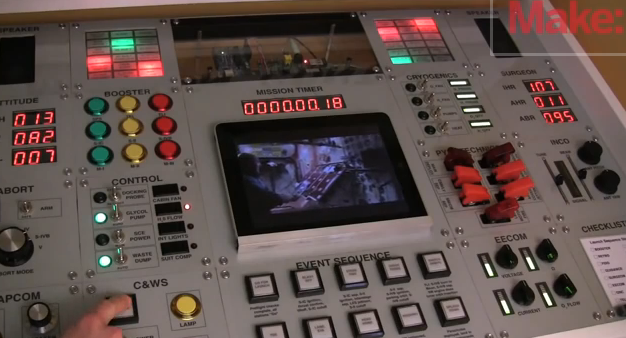 This Realistic Mission Control Panel is a Lucky Kid's Desk! Prepare to have your. mind. blown. I mean it: mouth agape, eyes wide open, unbelieving. Because this video is insane. Here's the Coles Notes version: a geek Dad makes his kid's desk into a mission control panel. Nope. Let me try that again: an uber nerd Dad, by the name of Jeff Highsmith built his kid a desk that is one of the most realistic replicas of a mission control panel that will shame anything your local science and tech museum has on display. Yeah, that's closer but it's still not quite it. You really have to see it in action because even though it looks incredible, it's the amount of components and programming that makes this one completely over the top. For real. See, this guy is the nerd equivalent of those Pinterest party-throwing moms we both loathe and admire in the same breath. I mean, who looks at his kids' desk and goes, hmm, I should turn that into a working replica of the mission control board? Only the most uber of uber nerds, that's who. In fact, he's so uber, he's got a ton of inventions showcased on his YouTube channel including an insane machine for self-hair-cutting and a pneumatic tooth fairy delivery system. His inventions are so creative and over the top that I'll bet his kids are the most popular ones on the block because they have the best. toys. ever. Trust me, I'm not even exaggerating a little bit. Check out the desk in action below, and then go visit Jeff Highsmith's site for more crazy inventions. Don't be surprised if you see his name popping up again on this site. My mind is seriously blown by his creativity and skills.